Experience the beauty of the Pacific Ocean in its most exquisite splendor. Located on the Bay of Banderas beach in the exclusive Ranchos Estate, this home is the perfect combination of beauty, spaciousness, luxury, and welcoming spirit. Designed by renowned Mexican architects Ruben Alvarez Ibarra and Enrique Garcia from Alvarez and Garcia Architects, it is the ideal destination for a large group or family, comfortably accommodating up to 20 people. Inquire for more information regarding rates. 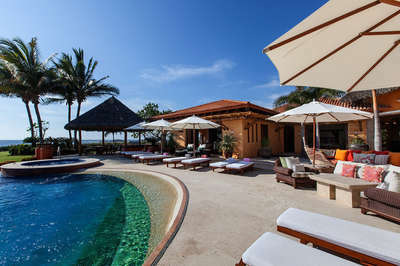 Ranchos Estates is a private, gated community of exquisite custom design oceanfront residences, all of which are located on a beautiful beach of white sand and just a three minute drive from the Punta Mita development. All the home sites average over an acre is size which guaranties their privacy, some of the most spectacular homes in all of the Banderas Bay are located in this community.